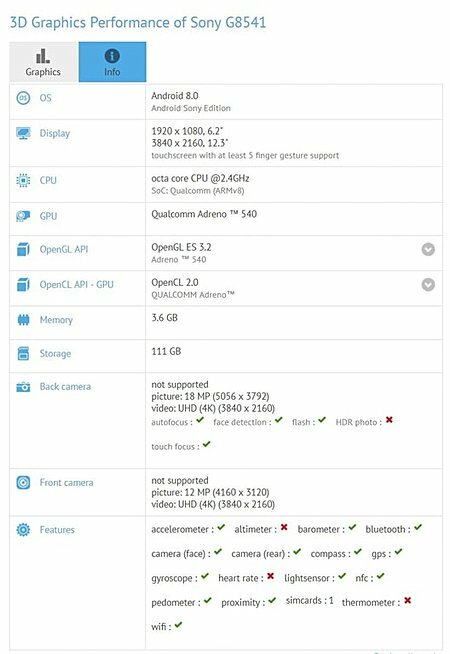 A new Sony smartphone has been spotted in benchmarks. Listed as Sony G8541 on GFXBench, the device is powered by a Snapdragon SoC with octa-core, 2.4GHz processor, and sports a 6.2-inch Full HD display. As you'd notice, the listing also reveals a 12.3-inch display with 3,840 x 2,160 pixel resolution. It's possible that GFXBench messed up while calculating display-related info. If not, then it could be that the device will have a tablet variant as well. Anyway, moving on, RAM is 4GB, while internal memory is 128GB. The camera department is handled by an 18MP rear unit and a 12MP front shooter. The device runs Android 8.0 Oreo. Smartphones are still primarily phones. Most apps are designed for 16:9 displays and it'll stay this way forever. Watching movies on a 6" screen is not a pleasant experience.